HELLO! MY BABY reboots the hits of Irving Berlin, the Gershwins, Gilbert & Sullivan and more, weaving their beloved songs into a hilarious fresh, new musical valentine to Tin Pan Alley song-pluggers, factory workers, debutantes, immigrants, Whiffenpoofs and gangsters on the sidewalks of New York in the nineteen-teens. Song-plugger, MICKEY McKEE, dreams of writing a million-seller hit tune to become the next Irving Berlin (PLUGGER’S PROLOGUE). The only trouble is, Mickey can’t read or write a note of music… Not until he teams up with BETTY GOLD, a feisty Jewish sweatshop worker, who happens to be a musical demon. Together they make beautiful music (PLAY A SIMPLE MELODY), writing a song Mickey thinks could sell a million and save the orphaned GOLD sisters’ Delancey Street Music Hall from the constant threats of JOHNNY GIOVANNI’s street gang, as well as land-baron STANFORD J. TIERNEY, who plans to demolish their Lower East Side block to build skyscrapers. Betty yearns to fulfill her beloved Papa’s dying dream – to write and sell songs (I’M ALWAYS CHASING RAINBOWS), but as she quickly learns from ETHEL COOTS, a tough female music publisher, song- plugging is a male-dominated field (A GOOD MAN IS HARD TO FIND). Undaunted, Betty dons the trousers she once sewed to hit the streets as Buddy O’REILLY. Betty’s disguise may fool the Gangs of New York (OH, JOHNNY, OH! ), but when Buddy wins Mickey’s job in a fierce Plug-Off (JA-DA), becoming the new King of the Pluggers, an intense rivalry ensues (SOME OF THESE DAYS). Mickey, clueless that his best girl and worst enemy are the same person, finds himself tricked by fate into collaborating with Buddy on a new waltz for the Debutante Ball of STANFORD J. TIERNEY’s sweet granddaughter ALICE (ALICE BLUE GOWN). At Alice’s Ball, romantic farce unfolds as Mickey woos Betty, Alice woos Buddy, and Alice’s Yalie brother, JUNIOR TIERNEY wins the favor of Betty’s hardworking sister FRANCES. (IF YOU WERE THE ONLY GIRL IN THE WORLD). But romance fizzles and the ball falls apart when the Gold sisters are unceremoniously booted from the restricted club, leaving Mickey in the lurch when his partner Buddy mysteriously disappears along with his girl, Betty. ACT TWO opens (AFTER THE BALL) with Mickey and Junior waking the Delancey Street neighbors in their attempt to win back Betty and Frances (HELLO! MY BABY). Tierney arrives, infuriated, and forbids Junior from returning to the Lower East Side. Betty tries to tell Mickey the truth about Buddy’s identity, but a hot-headed misunderstanding leaves Mickey believing instead that Betty can never love him because she’s in love with Buddy (I DON’T CARE)! To save his wounded pride, Mickey gets mixed up with Johnny Giovanni’s gang (BALLIN’ THE JACK) and now Mickey and Buddy must come up with a new song to save their lives (MY BUDDY/I AIN’T GOT NOBODY), Junior must deliver the Gold sisters an eviction notice, and Frances must convince the neighbors to occupy Delancey Street so they won’t end up homeless (AIN’T WE GOT FUN). Facing heartbreak and ruin, all decide THERE’LL BE SOME CHANGES MADE. Junior cashes in his trust, Tierney hires Johnny’s gang to torch the neighborhood. Johnny strong-arms Mickey into doing his dirty work and Buddy rescues Mickey with a song, unwittingly revealing “his” true identity (YOU MADE ME LOVE YOU). 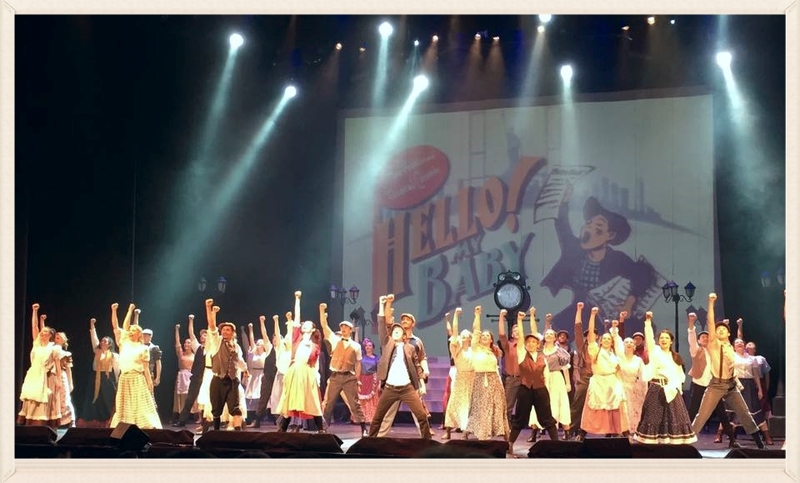 Mickey at last sees Betty for who she as love wins the day, the kids save the neighborhood, songs get published, dreams come true and a crackerjack singalong brings everyone together (HELLO! MY BABY).